SPI is a very simple, fast, serial contorl link. There are separate transmit and receive lines, which are full duplex, and a clock line. The PIC32 can transmit 8, 16, or 32-bit buffers at clock speeds up to the peripherial clock rate. The pins used for MISO and MOSI can be chosen using the PPS system. See also the Reference Manual Chapter. 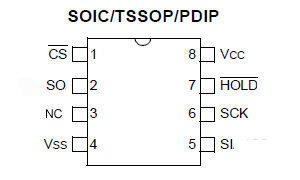 Typical SPI connections are shown below.Four pins are required: data out, data in, clock, and chip select. There are also specialized modes available: Framed mode will be used for DMA. configure the data width (8, 16,32 bits)-- You can change the data width at any time. Drop the CS line to start the transaction. Load the transmit register. Clock starts automatically and sends the data. Wait until SPI done. While waiting you can use the CPU for something else. At high SPI clock speeds (above a few MHz) it does not make sense to do a context switch or take an interrupt. Read the receive register -- every SPI transaction always does a transmit and receive! Raise the CS line to end the transaction. 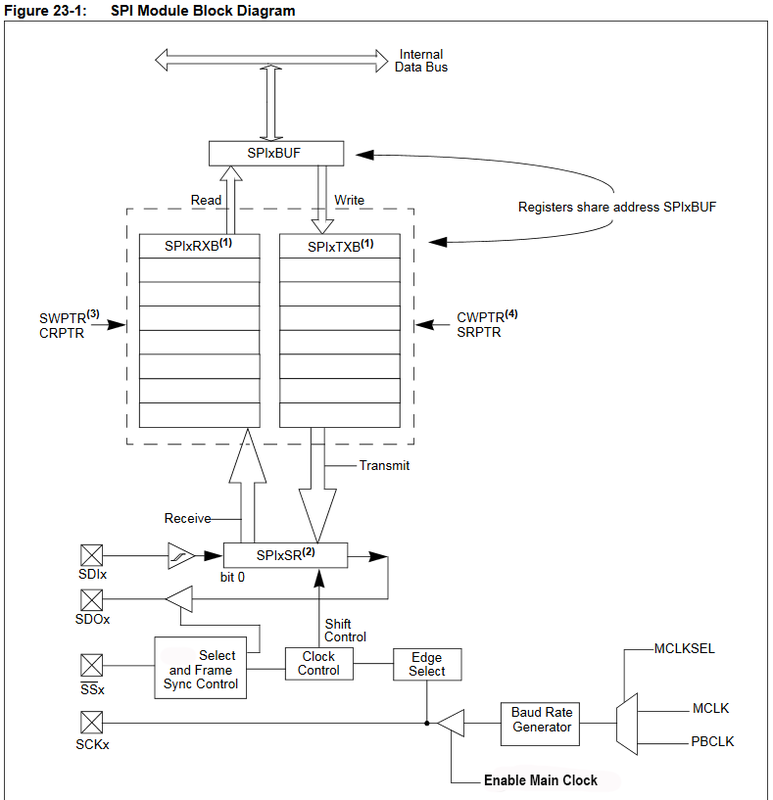 Internally the SPI channel is an independent clocked processor which sends/receives data. You need to worry about clock polarity and phase. Choosing these is hard because each different manufacturer uses different terminology to explain how their specific chip works. As far as I can tell, Microchip is consistent across their SPI devices. Otherwise I have figure out no better way to figure out polarity and phase than to try all four possibilities and see what works. An SPI channel can also be run in framed mode. This mode allows the SPI controller to toggle the chip select line, implying that only one peripherial can be attached to that channel, but simplfying program logic. See section 23.3.6 in the reference manual. Specifically, this feature allows a DMA channel to blast data out to a DAC or other fast device without using an ISR. The logic might be to set up a DMA channel hardware-triggered by a timer event, with a memory-source (flash or RAM) corresponding to a table of voltages and a memory-destination of the SPI transmit register. The DMA could be operated one-shot for a sound effect, or in auto-repeat mode for a signal generator. An example code, running on the big target board uses framed SPI mode, but in an ISR. 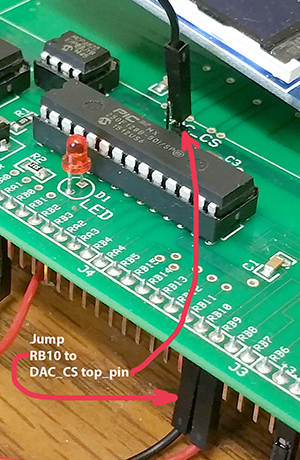 The i/o pin RB10 was jumped to the DAC_CS connector, as shown in the (clickable) image. Microchip makes a very nice 1 Mbit serial RAM, organized as 128K of 8-bit words (23LC1024). 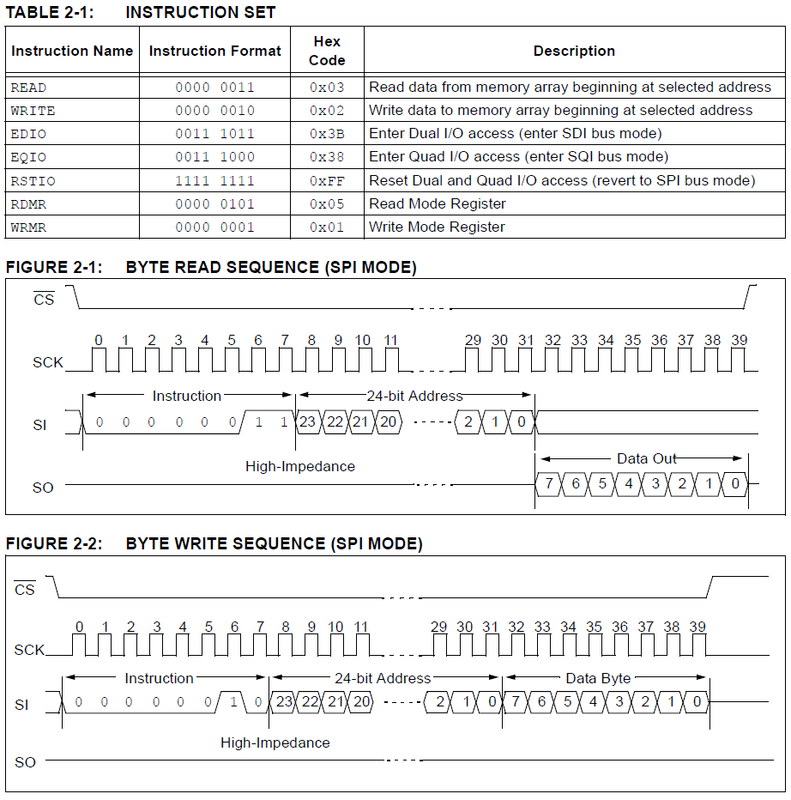 Access is controlled by writing a read/write conmmand ORed with a 24 bit address to form 32-bit SPI data. The read/write command occupies the top 8-bits of the 32-bit word. Once an command/address is sent, sequential bytes can read/written using 8-bit transfers. At 20 MHz SPI bit rate, writing the control word (including mode-setting overhead) takes 2.2 microseconds. Each sequential byte read/write takes 0.75 microseconds. The demo code is arranged as a command line interface for testing the RAM connections and read/write logic. As usual, the program requires the protothreads environment. There are functions for read/write a single byte or an array. The RAM defaults to sequential write mode at power-up. This feature is used to write multiple bytes. A bit of timing information from the data sheet. --The second example is a particle system explosion. Without doing any space optimization 1500 particles (along with screen buffer) use up memory. All the positions can be updated in every frame. Giving each particle a high initial velocity, and high drag makes a nice cloud. -- The third example is a particle system fountain, which is a slight modification of the explosion. I optimized the point-draw and one ISR for more efficient execution. Frame update now takes 7.2 mSec. Video. 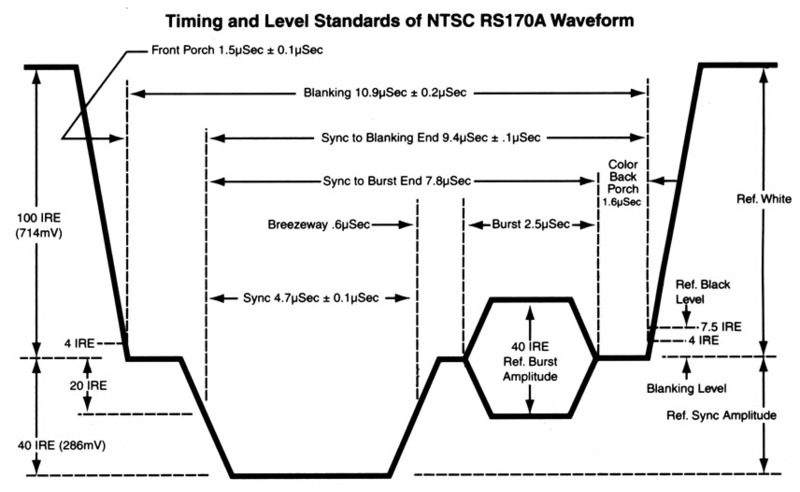 The overhead for NTSC TV signal generation is about 5 microSec per 63.5 microSec line, or about 8%. You should use this optimized version for an intensive animation. A small variation makes the particle system fire to the side. Video. 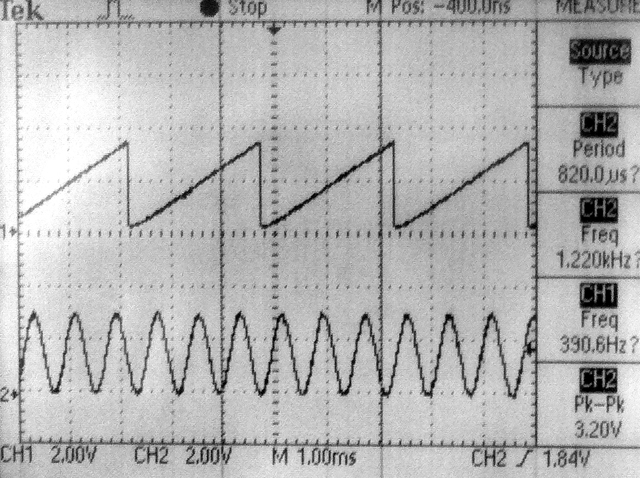 --The fourth example turns on the ADC to make an oscilloscope. The ADC is set up to trigger from the timer3 compare match signal, but without turning on an ISR. A DMA channel transfer is then triggered by the ADC done signal to dump the ADC results to memory at up to 900 Ksamples/sec. This ADC hardware process runs at the same time as the video update hardware process, so video is not disturbed. 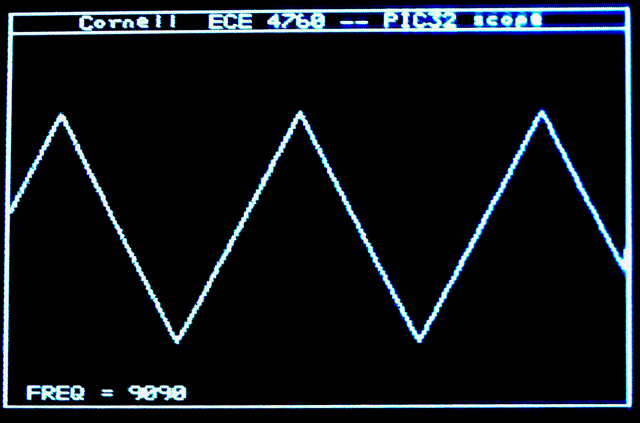 CPU load is small so there is time to draw the ADC waveform to the screen. It would be straightforward to add a button state machine for scope control and a FFT. 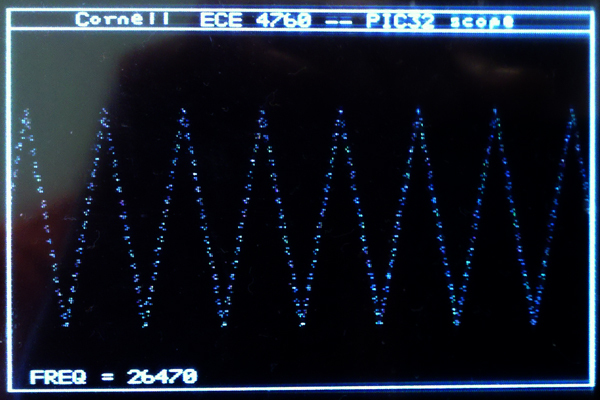 The following image is captured from the NTSC screen and shows the scope running at 900 Ksamples/sec and displaying a frequency estimate. Video is running at 500 Ksamples/sec ADC rate. -- The fifth example is a vector variation of the scope. Drawing all the vectors slows the redraw down so that the scope is updated 30 times/sec. Video is running at 900 Ksamples/sec. Still image below. You clear the SYNC bit, write to SPI1BUF to trigger the hardware trnasmit/receive, wait for it to finish, then do the manditory read and set the SYNC bit. Connections between the two devices are shown below, assuming a certain PPS setup as shown in the code. In addition to the SPI protocol, each different device you attach to the SPI bus has a command syntax which is specific to the device. In this case, the first byte transmitted has the following bit definitions, while the second byte represents the voltage output in straight binary, where binary zero outputs zero volts and binary 0xff outputs Vref.. The following image shows the SYNC on the top trace and the SCK1 on the bottom trace. The core frequency and peripheral bus frequency are set 40 mHz. The SCK1 is running at Fpb/2=20 MHz. The total transaction time for the two channels is 2.6 microSec. 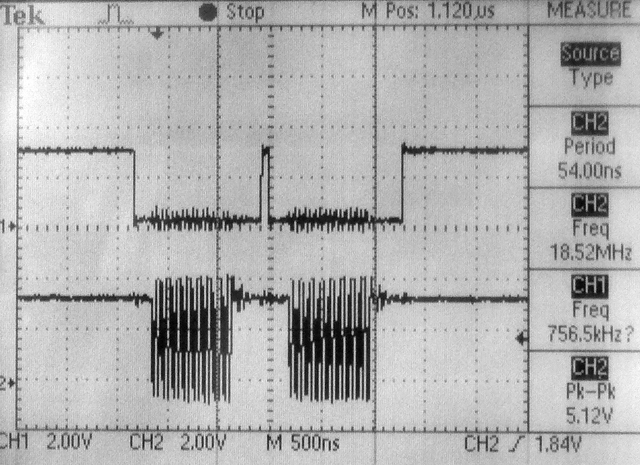 The second image shows the DAC outputing a DDS sawtooth on one channel and the ADC input on the other at a sampling rate of 100 KHz. Setting the core and peripheral bus to 60 MHz runs the AD7303 at its maximum bus speed and drops the total time to transmit one 16-bit transaction to 850 nS and both channels to 1.75 microSec. The code in the ISR was arranged so that all ISR housekeeping is being done while the SPI hardware does the transmit. Microchip doc site on this page choose Documentation from the left column.